Headlines > Priorities > Brexit > Current page:: Tajani: "Brexit will be a particular challenge for Ireland and its people"
Tajani also expressed his "understanding for the deep political and economic ties that link Ireland and the UK”. Describing Ireland “as a small European country that has been transformed by its EU membership”, Kenny stressed the “fundamental role" that the European Parliament would play in any Brexit deal. In Brussels to discuss the impact Brexit will have on the island of Ireland, Kenny expressed his hope that the upcoming negotiations would result in the “closest possible relationship between the UK and Europe”. The British government is expected to trigger Article 50 in the coming weeks. 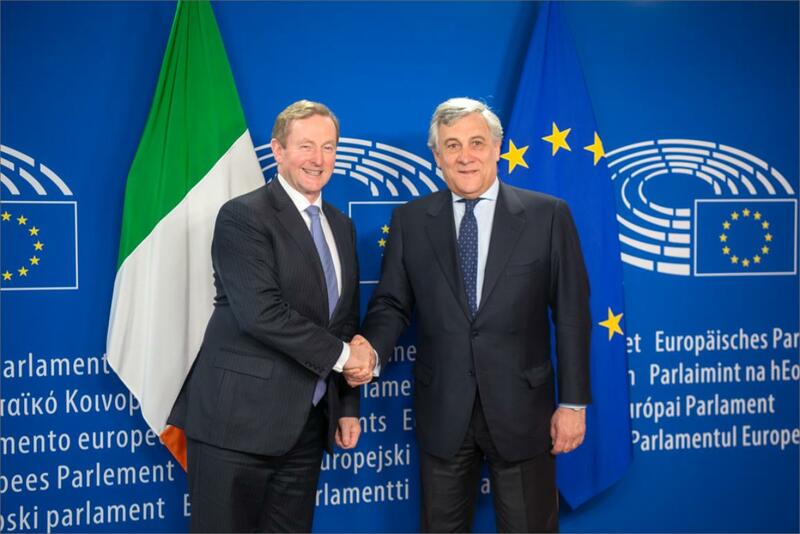 Following his meeting with the Irish leader, Tajani said: “Ireland must ensure that its economic and trade links with the UK are protected. Secondly, it needs to make certain that the achievement of the Good Friday agreement which brought peace to Northern Ireland is included in any future deal between the UK and the European Union.” He added: “Both issues will have the full attention of the European Parliament." Noting that “Brexit opens a new chapter in the Union’s history”, Tajani said: “The negotiations will be complex and unprecedented and in this context we will take into account Ireland’s concerns.” He added: "The European Parliament will have a central role in deciding the outcome of the negotiations." From an Irish point of view, the Irish Prime Minister described the main areas of concern as the Irish peace process, maintaining the open border between Northern Ireland and the Republic, and future relations with the UK. Referring to the debate on the future of Europe which took place in the Parliament on 1 March, Kenny said: “We need to demonstrate unity, we need a commitment and a resolve to ensure that the Union remains essential to the future peace and prosperity of all citizens.” He also described the EU as “an indispensable source of stability”.